Carbide studs are reputed to last a long time. 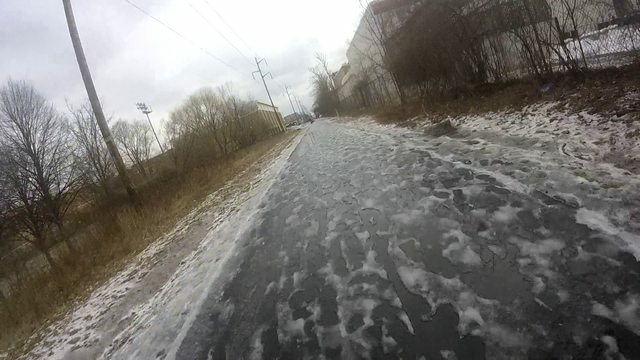 I ride studded tires all winter from December to March, nearly entirely on bare, wet, and/or salted pavement. My first pair lasted several seasons, and may be still useable. However, now my beater bike is an aluminum Diverge Elite road bike and I have 30 C Schwalbe Marathon studded tires, the narrowest I know of. I've not had a significant snow challenge with them since I ride well-plowed roads, but the previous (?) 35 C tires were good up to about 3 inches of new snow. I really like the Schwalbe tires because I don't seem to feel the increased rolling resistance many claim for more aggressively treaded studded tires. I ride studded tires all winter from December to March, nearly entirely on bare, wet, and/or salted pavement. My first pair lasted several seasons, and may be still useable. Good to know, after the next snow/ice storm I will defintely go back to my studded tires. 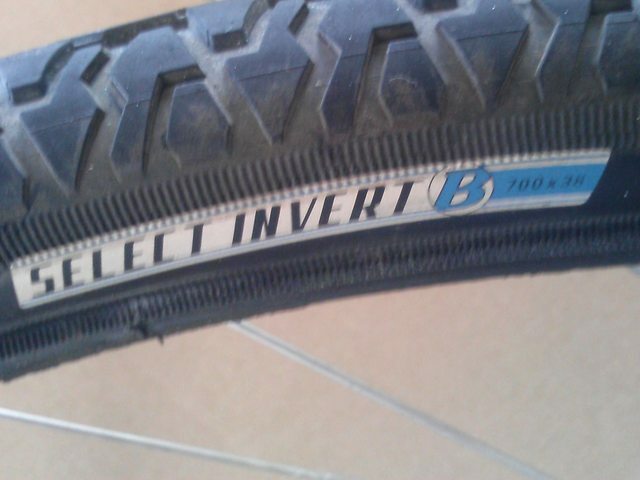 Below is the patch that got me yesterday, doesnt look like much but it was enough to confuse my Bontrager 38c tires and dint my confidence a bit that I've been building all winter. Last edited by anx; 02-11-18 at 10:36 AM. [QUOTE=anx;20162736]I wish I had mine today for 5-10 minutes for the icy patches I hit (see above), but with the warmth they would have overkill for 90% of my ride. Does using them unnecessarily on 'normal' conditions wear them at all I wonder? I haven't used these particular tires long enough to speak to the long term implications yet. The immediate drawbacks (IMHO) is they are substantially heavier and noisy. I've noticed the weight slows me down at my usual cadence or wears me out faster when trying to maintain a particular average speed. Funny thing happened about 2 months ago. We started getting serious snow, and neither of my two Winter bikes were in ridable condition. Between one thing and another, I didn't manage to get either one ready to roll until yesterday afternoon, when I finished rehabilitating the old GT Karakoram shod with studded Nokians. So, you might think that that was the bike I took on the first ride in 2 months (gack!)... but no. Given how clean the recent downpour had rendered the streets, washing away the road salt, I took one of the bikes I don't normally ride during the salty months, the Ebisu All Purpose. This was strictly based on what I felt like riding, bolstered with an optimistic estimate of conditions that could be seen as courting divine intervention from Murphy, given that this bike doesn't even have fenders. 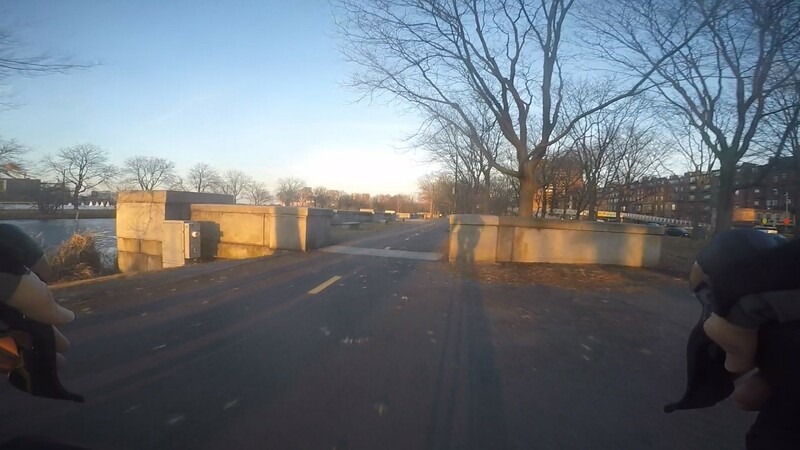 So I headed out the Minuteman to see what was left of my legs after the hiatus. Conditions were good enough at the start, and it was a pleasure to be pedaling along a familiar route again. In Lexington, I started to encounter sections of pavement wet with meltwater, black ice by tomorrow morning but just a reminder about the desirability of putting fenders on the Ebisu now. When I got to Maple Street, I found a large, icy puddle that convinced me that my accidental prayers to Murphy had been answered in the usual way, so I turned around. I'll come back with the GT and its carbide shoes. A pastel sunset was in progress in East Arlington as I rolled home, and the temperature had dropped to 39. A short ride, but a merry one, and it was good to be back on the bike. Last edited by rholland1951; 02-12-18 at 06:05 PM. In the 50 plus forum, there is a thread Favorite route, loop or out/back ? And while I often will be on the same roads/trails, sometimes I do an out/back, sometimes a loopy, but frankly, usually spaghetti. I usually stop more than one place. Even out on "joy" rides I always have the messenger bag with locks. I nearly always stop at a cafe and stop off at a couple of other somewheres to pick up a thing or two. Neither loopy nor out-and-back, though there are a few loopies and some out-and-backs too. Very interesting, especially the NE and SE excursions. Yes, it is. I observe that on that map there is no crossing the Mystic River. Perhaps further north though. You can't cross on the Tobin or on I93. But on the map you can see Alford St (99), Main St (Medford) (38) and River St/Harvard Ave. Just off the map is Medford St/High St (60) double rotary. After that it is no longer a river. So that leaves out Boston Ave, Main St (Somerville), Winthrop St, Fellsway, and the multiple Mystic Valley Parkway (16) Crossings. Contrast with the Charles all the way out to Waltham, where I have crossed every bridge except Arsenal and Moody. Nice summary, -mr. bill. Just his past Sunday I was discussing Metro Boston routes from Downtown, and we both agreed how tedious it is to get to the North Shore and northern suburbs. I now consciously recognize that it's due to the limited bridges over the Mystic River. Last edited by mr_bill; 02-14-18 at 08:33 AM. 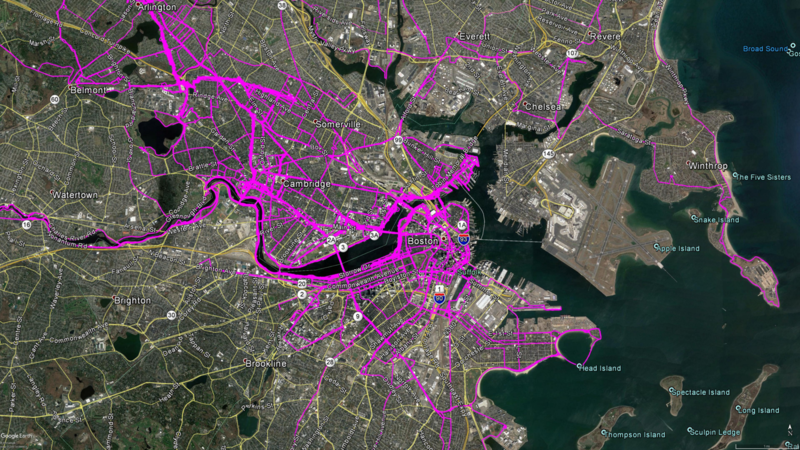 @mr_bill great map, i got all my rides updated and tcx files saved somewhere, what did you use to combine them all together? 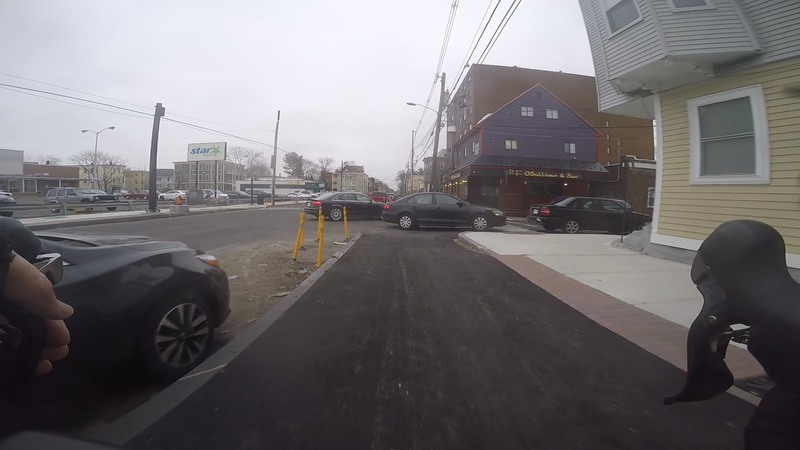 Cycling through North Shore, other than the northern strand trail, isnt all that fun, especially Chelsea and Revere, with the alot of the roads not having bike lanes and those with 'sharrows' being very dangerous as few drivers obey them, take it from me. I use Runkeeper Live to track myself and then periodically export to Google Earth Pro. Got used to walking all over Medford, Malden, Melrose, Everett, Chelsea, Revere, East Boston and Winthrop half-a-dozen years ago, but still need the earpiece to get me around by bicycle. The new thickly settled speed limits have helped a lot, and there are a few delightful streets (Park Ave in Revere for example). It is interesting to see the variations between cities and towns. Watching changes over time will be interesting too. Frankly its somewhat amazing how well the jigsaw fits together, sometimes the borders just melt away under our tires. OK, I want to like this, but it’s hard to. My first time since they’ve reopened the lane. I actually rode quite a bit faster than I should (do not try this at home!) but was just trying to keep to typical Amsterdam path speeds rather than road speeds, just to see what it was like (traffic was light and only one person walking), and yes trash day makes this worse, and it’s still not done. But the hydrants and utility poles and concrete driveways conspire to make for a slow descent. 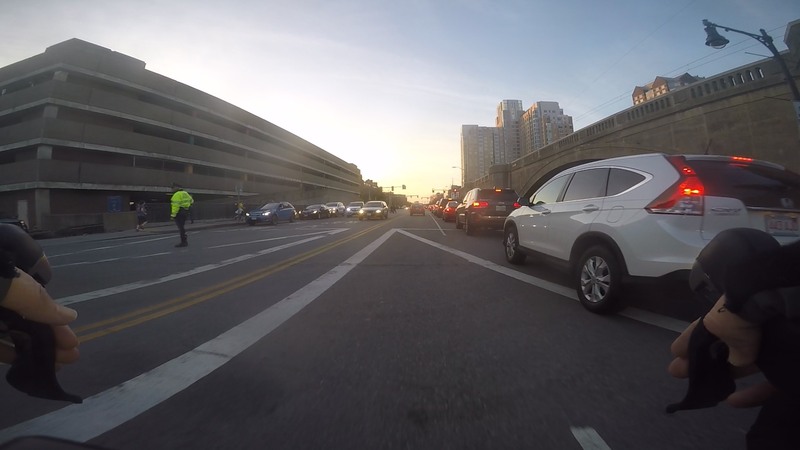 Even with shoulder checks, the transitions at some intersections are awful. A couple of surprise we’ll dump you here you figure it out moments too. 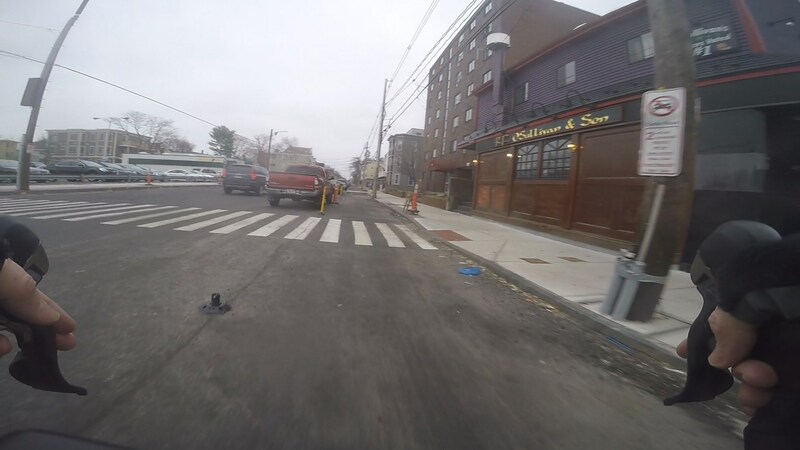 Is Somerville trying to out do Cambridge (our fair city) MA in stuff that should be good, but is far from it? Update. Do you want the good news or the bad news first? Finally good weather on a day that I'm home. First time taking the bike out since November. Managed just over 14 miles which isn't bad for me. My longest ride ever was 20ish so considering I haven't been on the bike in months, I'll take it. I'm lucky to have a lot of great areas to ride near my home with designated scenic roads. Planned to ride the trails at Borderland State Park, but it was really crowded being a perfect spring-like day and school vacation. People walking those trails are usually oblivious that there is anyone else at all out there, so I try to avoid it when crowded. Kept going toward the lake. Look where I ended up? Guess I deserve a kiddie cone, right? It's so nice out there right now, going to try to get a quick hour or so in before it gets dark. I went out for 25 Friday evening with the CX0 tires and had a great ride. I mounted the Schwalbe Winters for Sunday's 45 mile ride which kinda was grueling slow and arduous with the Schwalbe Winters. 99.99% of the ride there was no ambiguity as to if I might need them and their heavy clackety studs. The roads were far from nice but the shoulders weren't icy. Being kinda fearful of black ice I left them on and went out this morning for another 23 miles. Mid 50's, totally didn't need them. After about 200 miles with them I can honestly say I love knowing that I have them and I hate using them. Thankfully it only takes 10 minutes to swap tires around. I just remounted the CX0's for tomorrow. I rode my commute again today. Sure felt like spring out there. Light traffic too, which I suppose is due to school vacation week. First sunburn of the year: 02-21, a new record. Woburn's flock is out. To paraphrase Mark Watney, free range, all natural, organic, Woburn-grown turkeys. You don't see that every day. Except in this case you could. I didn't today though.